Digital Marketing Blog in India | Digital Marketing Blogger - Ajay Chhabra: Seagate Introduces Buy for Free Offer..
Seagate Introduces Buy for Free Offer.. Recently Seagate has launched a new offer - Buy for Free. 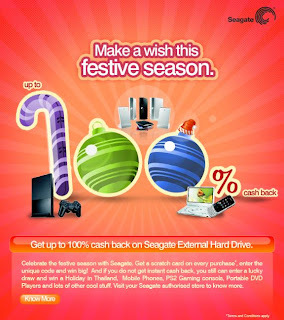 Celebrate the festive season with Seagate. Get a Scratch card on every purchase* enter the unique code and win big ! And if you don't get instant cash back, you still can enter a lucky draw and win a holiday in Thailand, Mobile Phones, PS2 Gaming consols, Portable DVD Players and lot of other cool stuff. Visit your Seagate Authorized retail store to know more. The campaign is live on number of portals and on Google Search.